The Multi-functions Hydraulic Massage Table Ecopostural C7791 in 3 parts with an hydraulic height adjustment operated by foot pump. Its steel frame with white epoxy powder coating heated at 250º is equiped with a frontal piece with high resistance polypropylene curved feet and a lateral piece. The Multi-functions Hydraulic Massage Table Ecopostural C7791 offers retractable castors with a one and only foot lever and a detachable paper roll holder is included at the end of the massage table. The headrest of the table has an oval breather hole including bung. The massage table can support a maximum weight of 175 Kg and its vertical height can vary from 51 to 105 cm. - Couch sections adjustable: Headrest by a gas spring, the lumbar section by a gas spring, feet section by a gas spring. The standard headrest back version has an oval breather hole including a bung (Standard T05 ). Headrest's version T06 with a rounded breather hole is available in options by request (select the option during you order check-in). - II / Soft = approx. 25 kg/m3. - III / Medium firm = approx. 40 kg/m3. - IV / Firm = approx. 100 kg/m3. - V / Extra Firm = approx. 150 kg/m3. 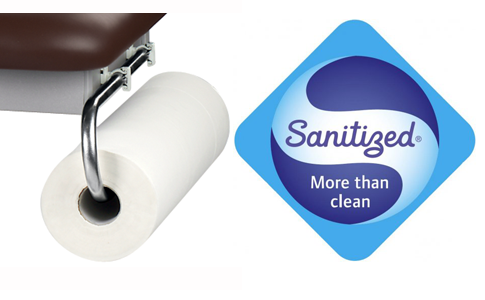 The II / Soft foam firmness is available on every folding table, electric / hydraulic table and the fixed ones. 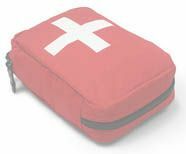 However, electric / hydraulic tables reserved for special use, that is to say : osteopathy and multi-functions tables, have a III / Medium firm (approx. 40 kg/m3). Higher the foam's density is, even more firm and resistant will be the foam under pressure. By this way, a foam firmness of IV / Firm (approx. 100 kg/m3) or V / Extra Firm (approx. 150 kg/m3) will be more suitable for the practical of osteopathy. 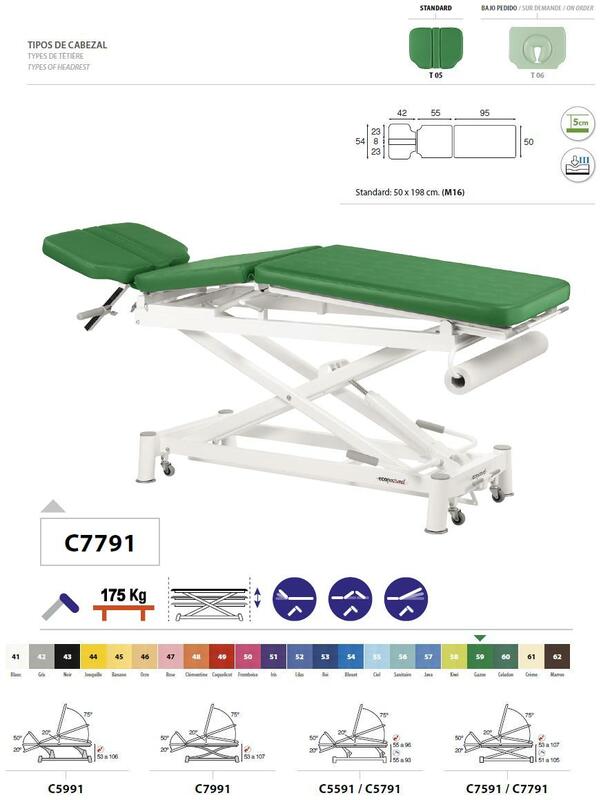 More info about Multi-functions Hydraulic Massage Table Ecopostural C7791 ?